Ax D. WhiteMan - Ax D WhiteMan Show ! Ax D WhiteMan Show ! 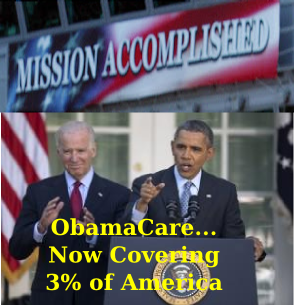 On the fitting day of April 1; the Obama administration loudly proclaimed that about 3% of Americans have opted to enroll in ObamaCare - and that constitutes a resounding success. So resounding in fact, that the President deemed the "debate" over the law's future to be OVER. Somewhat predictably, much of the GOP has taken the "numbers bait" and called into question the validity of the WhiteHouse numbers. Yes, some think that the same administration that fabricated a tale of organic Muslim unrest driven by an unseen YouTube post to explain the Benghazi attack - might be "fudging" the numbers. This is the wrong argument. The underlying of fundamentals of "ObamaCare" are antithetical to the founding American principles of individual liberty and a Constitutionally limited Government. To divert the discussion to be about the quantity of participants - is to lose the argument about the underlying evils of ObamaCare. It's as if in lieu of Health Care, the administration decided to solve the issue of Unemployment using the same concept, and passed "ObamaJob" instead. 2. All available jobs would meet the approved "ObamaJob" criteria and be listed on the "ObamaJob" website. 3. All current jobs not meeting the qualifying criteria of a job will be cancelled. 4. A myriad of un-elected boards and commissions will be established to determine what qualifies as a "job." - as the Secretary shall determine. 5. Anyone NOT signing up for an ObamaJob will be fined. Then, after 5 years of executive changes, total employment market disruption, massive layoffs, the administration announces that 7 million people now have ObamaJobs - thereby calling it a resounding success. -How many just switched jobs ? -How many have actually received pay checks? -How many were unemployed because ObamaJob caused them to be laid off? The implication of these questions is that if the answers to the above were; 0, all, and none; then the ObamaJob law was just fine and dandy - and all that talk about individual liberty, and limited government was just happy talk. Upon some reflection, if the opponents to ObamaJob were, Boehner, McConnell, and the increasingly lame Fox News analysts - they'd probably react exactly the same way. There are two trends in national voting patterns that is strongly in favor of Republicans, no wonder that it's rarely mentioned in major media. Both trends may be rooted in the same phenomenon. 1. Republican success in State Legislative elections. 2. Conservative success in "off year" elections. The conservative success in "off year" elections is somewhat more subtle, but every bit as important. This trend began in 1994 with the Gingrich lead "Contract for America". In 94 the GOP stunned Bill Clinton and the liberal media by winning a House majority for the first time in over 40 years. It is a long held political theory that the Party that does not win the Presidency "normally" gains seats in an off year election. We contend this is an outdated theory that is no longer operative. Consider, for example, that in the following "off year" election (98) - Republicans only lost 5 seats in the House, and none in the Senate. The following "off year" (02) the Republicans gained in both houses - defying all conventional wisdom. But what of O6 ? The Republicans got creamed - right? But not by Democrats. Republicans got creamed by Conservatives. Conservatives had finally had enough of the empty rhetoric of the GOP. The big spending, large Government Republicans had worn thin on the Conservative portion of the party, and many of us sat out the election - or even cast a protest vote. Democrats capitalized on this by positioning a number of Congressional candidates as "conservative" Democrats. The result - voila - Democrat Congress. The pop culture icons can do a good job of creating a wave of enthusiasm for a single national candidate. Often, they also receive some additional boost to their own status because the left leaning media is far more likely to broadcast the endorsement of the Democrat candidate. Not so for "mid term" and State Legislature races. There's very little chance that Oprah et al, will lower herself to weigh in on a State of District race. Accordingly, the low information voter has no motivation to vote in these elections, giving conservatives a decided advantage. The contention here is that the mid term election voter model does NOT favor the "Party out of Power" - it favors "The Informed Voter" ie, "Conservative Voter." Increasingly, Democrats must rely on the politically, and historically illiterate to win elections. Unfortunately, this is a large group. It is difficult to motivate this block, however, lacking a pop culture advocacy that brands support of candidates like Barack Obama as more of fashion statement than a political position. Given this reality, Republicans will consistently face an uphill battle in National Elections - fortunately - there is only ONE National election. Ok, from time to time, the media can cherry pick a local election or two and change an election. Todd Akin, comes to mind. But they just can't create waves of uninformed support for a multiplicity of candidates. During six years that have been dominated by two decisive Democrat Presidential victories; Republicans have cleaned up in State Legislature elections, and Congressional elections. Even in losing, Mitt Romney "won" more individual congressional districts than Barack Obama. This serves to underscore the point that most of the GOP congressional majority is "safe," largely due to years of gerrymandering (by both parties) but most recently by Republican held State Houses. Currently many Democrat Senators in conservative States hold their seats as something of a throwback to either the "old" Democrat party, or strong personal name ID. Undoubtedly, the rotation of 6 year Senate elections to "mid term" elections will inevitably place the Senate in GOP hands as well. Oddly, the only thing on the political horizon that could alter the inevitability of permanent Republican Legislature - is wholesale amnesty for illegals. The presence of significant numbers of newly empowered voters could reasonably be expected to exercise more diligent voting habits. This would be especially true in States with large currently Illegal populations; like Texas, Arizona, and Nevada - even Georgia and Florida probably have enough to tip the balance of power away from conservatives in mid term elections. So why is the GOP pushing for "Immigration Reform?" Good question. There are lots of theories. None of which are particularly convincing. I've come to believe they believe it's their best way to maintain most of their safe seats, enjoy the trappings of power, and never have to really deal with governing. With apologies to a fine athlete, I call it the Brady Quinn syndrome. What motivates the GOP leadership will remain a mystery to many of us; but if conservatives recognize and take advantage of their current advantage in "mid term" elections - the country may once again be The Land of the Free. In recent weeks, there have been increased news coverage of what has been called, "The Knock Out Game". Oddly, the "news" coverage of this "Knock Out Game" is nearly as polarizing as the game itself. In much of what we call "main stream" media; the Knock Out Game has been portrayed as an Urban Myth. The USA Today , Slate, and The Atlantic, have all published pure denial pieces challenging the idea that the Knock Out Game is a trend at all. More commonly the main stream media have adopted the baffling logic that the Knock Out Game ISN'T a trend, and ISN'T particularly disturbing because its not new - it's simply been re-named. They point out that it's just another version of "wilding" from the 80's or "happy slapping" from the UK, or "flash mobs." as we're informed by NPR and numerous other media outlets. Even while attempting to denounce the Knock Out Game, Clarence Page mimics NPR's dismissive description of the Knock Out Game as - yesterday's news. Then there is the "other" side. Hannity, Breitbart, Drudge, and numerous talk show hosts have repeatedly high lighted the Knock Out Game and also decried the media bias against reporting it. Many on the right have discussed what has become the defacto bible on the Knock Out Game - Colin Flaherty's "White Girl Bleed a Lot"
Perhaps unwittingly, both sides are behaving in a manner that promotes racial divisiveness. The left leaning mainstream media; by tending to ignore or excuse these brazenly violent racially motivated attacks - they create resentment in white's. Simultaneously, promoting the concept that the Knock Out Game is a right wing media myth, and just another right wing tactic to vilify young blacks causes resentment and anger in many blacks. Also, by under reporting or denying that the Knock Out Game exists - the media deny the opportunity for other blacks to denounce it's practice. The right wing media, including Flaherty and those promoting his book; have fallen into a trap of generalizing the criminal racist acts of numerous individuals; and present them in a manner that leads one to believe that such acts are widespread and common. Flaherty's work covers several years and spans the entire country. He accurately documents "Hundreds" of what appear to be racially motivated crimes by blacks committed against non-blacks. While Flahrety's work appears documented and accurate and may be sincere attempt to correct for media bias in under reporting such incidents - it can become equally divisive when one ignores the breadth of the context of his work. We must remember these crimes were all committed by INDIVIDUALS. All of these INDIVIDUALS deserve to be apprehended and punished - as INDIVIDUALS who committed crimes. Assigning the actions or words of an INDIVIDUAL to an entire group is common leftist tactic. Like taking the stupid comments of someone like Todd Akin, or Jim Wheeler, and attempting to assign them to an entire party - despite the party unanimously denouncing their words. It is vital that we remind ourselves that in any objective reality, White People in general have nothing to fear from Black People - in general. To attempt to generalize this evil behavior as somehow "typical" or "widespread" is just incorrect. Every day in America, more than 40 million black people cross paths with about 300 million "non-black" people without the slightest inclination of ill will or violence. Obviously, the reciprocal of the above is also true. When Governments seek increased control over the population, they often promote the fear of one group against the other. This is the real danger of the Knock Out Game and it's current reporting in the media. When people fear each other - they turn to Government for protection, and in doing so, will often sacrifice their own liberties as well as insist that the liberties of others be infringed upon - for their own security. Instances of irrational violence must be reported objectively. In doing so, let's also widely report those that denounce it for the evil that it is. Thank you Al Sharpton and Mike Tyson. We must ALWAYS remember that INDIVIDUALS commit crimes - not RACES. We must not allow media bias - on either side; to convince us that our fellow citizen is our enemy. This is how people end up in ovens. Which brings us to the image at the top of the page. It's Miri Bin-Ari. 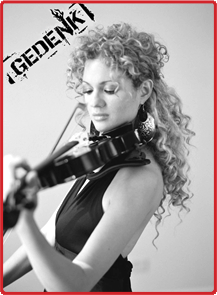 Bin-Ari is an uber-talented musician, and founder of Gendenk. She's also recently condemned the Knock Out Game. "Gendenk" means "Remember" - and her organization is devoted to remembering the holocaust and how a civilized society was manipulated by fear into believing the mass murder of Jews was acceptable. I implore my fellow Americans, of all races and creeds, to reject racial divisivness and "Remember" (Gendenk) what can happen when we allow media and government to divide us against each other. History is marked with pivot points. Those are points at which a seemingly inevitable outcome is dramatically altered almost instantaneously - often due to the single decision of a single individual. Few of these pivot points were as dramatic as the Battle of San Jacinto; and it bears more than a few similarities to the current Battle of ObamaCare. The Republic of Texas had declared it's independence from Mexico. The Mexican army was in the process of destroying this rebellion. Mexicans slaughtered Texans at battles of Goliad and The Alamo. The Texas army was in retreat from March 13th until that fateful day of April 21st. 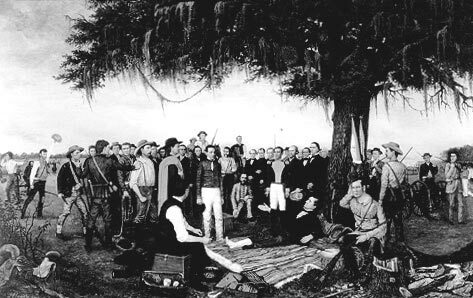 As the Mexican army pursued General Sam Houston's retreating army, the force was heckled and jeered by locals, ridiculed by the sitting Texas President, and faced a mounting mutiny by soldiers that wanted to engage the Mexicans. Finally trapped at the banks of the San Jacinto River, Sam Houston stopped his retreat. The Mexican army, somewhat weary from their long pursuit, knowing the Texans were trapped - decided to make camp, rest a day or so - and kill all the Texans when they were better rested. Though historical accounts are unclear, I'm sure that a furious argument over "tactiics" ensued in the Texan camp. The assumed tactic was to reinforce their position and hope to repel the inevitable Mexican attack. But someone came up with "a better idea." Realizing the Mexicans, believing the Texans were trapped, had allowed themselves to become vulnerable to a surprise attack. This "better idea" eventually prevailed, and in broad daylight on April 21st, 1835 the Texans attacked a "resting" Mexican army - and killed almost all of them - in about 18 minutes. That decision and ensuing act changed what seemed to be an inevitable course of human history. Today, every Texan, and to some degree, every American and Mexican lives a life with the inherited benefits of the outcome of that battle. Today, John Boehner and the GOP face a similar situation. The ObamaCare legislation that is emblematic of a seemingly inevitable trend from Liberty to Authoritarianism has been left vulnerable by a Democrat Party that believed it would hold permanent majority status in Government. The Democrats could easily have protected ObamaCare from a "defund" effort in the House (where the GOP majority has every vote it needs to do so) by simply passing a Budget. Even more brazen, the Democrats allowed the current approved funding for Government, and the debt ceiling limit to virtually coincide with the implementation of ObamaCare. It NEEDS the cooperation of the GOP lead House, both for continuing operating funds (CR) and for a debt limit increase. Boehner will soon face a decision much like Sam Houston. Despite the heroics of Ted Cruz, he will soon receive an amended CR from the Senate that fully funds ObamaCare. He can use this momentary vulnerability to attack ObamaCare, and send it back EXACTLY as originally passed. Despite the emphatic proclamations to the contrary - it's quite likely that it will be the Democrats that quickly cave in the wake of a Government shut down. Seriously, who needs Government more? Democrats and their constituents or Conservatives and their constituents? The remaining question is whether Boehner will attack ObamaCare at perhaps it's last point of vulnerability, begin to reverse the march toward Authoritarianism, and take his place in history as the political General that changed the course of history - or will he just be the putz we all assume he is.